Valencia 14th February 2010, Images from the second race, winner BMWO against Alinghi. The deciding race allowing BWO to take the cup back to USA. The race started 5 minutes before the deadline of 16.30. Alinghi received a prestart penalty, BMWO starts at the pin-end and Alinghi at the racecommitte..Alinghi takes the right side of the course and BMWO the left side. 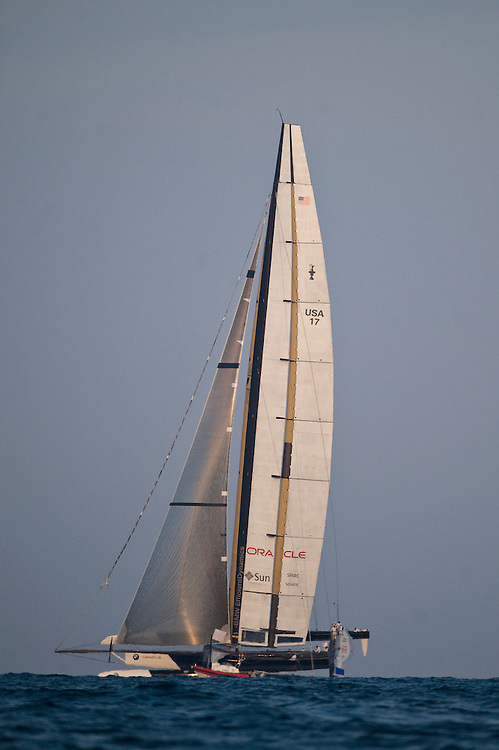 After a wind shift Alinghi gets to the weather mark first. BMWO take the lead at the mark and sails the two remaining reach legs in front of Alinghi winning the race..Skipper BMWO James Spithill, Alinghi Skipper Ernesto Bertrarelli.